Depends how much you like news. I only did a brief tour of the museum before it opened, so I didn’t see everything, but it looked like it wasn’t worth it unless you’re a big news buff. If you live in DC, why not wait until the inevitable price drop? People with vertigo should think twice before going. The huge hole in the middle of the museum made me feel sick, and you have to walk around it several times to see exhibits. I also toured before it opened. It’s full of enough blaring sounds and flickering lights to give people a migraine and an epileptic seizure. And the precariously low railings around that central hollow area made me dizzy and ill. If you have mobility problems, call ahead–the elevators to go from floor to floor are hidden and you really need a personal guide to get around the place. Most people will be using the stairs, some of which are that too-shallow kind that make people (me, at least) stumble. On the plus side, news is great! I’m always up to read/watch news stuff. Thanks for the heads up. As someone afraid of heights, I think I’ll be hugging a back wall if I go. But at $22, I’m still thinking that a steep price to pay. I have yet to even make the Spy Museum because its $20 ($18 + $2 online “convenience fee”) more expensive than the Smithsonians. I welcome your rant. I have the same,a nd wait till Carl steps in with his “convenience fee” tirade. Worth $2 to see that! Most of the new DC museums charge expensive (well expensive to Washingtonians) admission fees – so I’m not surprised by the $22 Newseum price. I paid $18 to go thru Crime and Punishment, $18 to go through the Spy Museum and a friend of mine spent $20 for Madame Tussaud’s. We’re used to not paying to go through our museums (Thank You Smithsonian and National Gallery), but I’m always surprised when I visit Chicago, San Francisco and New York and spend close to $100 to go through various art and natural history exhibits. We’re just really lucky that most of our museums don’t charge. I went to the Newseum a couple of weeks ago and thought it was pretty cool, but like all museums, it was a bit overwhelming. Waaaaay too much information to digest in one visit. But is it worth $20 (I bought my ticket there, not online)? Yeah sure. Once. They have some great exhibits and a lot of interesting artifacts on display. I don’t plan on going back there again though as I’ve “been there done that”. And I concur with Monica. 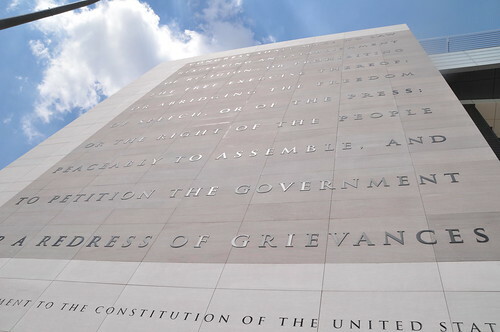 With all the money you’re saving thanks to the free Smithsonian, cough up a little and go check out the Newseum. $20 for Madame Tussaud’s? Wow, now that is a fools bargain with real art free and nearby. It’s true that most of the museums in DC feel pretty steep. Compared to free anything is expensive, of course – but $20+ a pop is high even compared to other cities (and in other cities, many donation levels are “suggested” rather than required). I think it’d be nice if these museums offered a discount to local residents (both District and VA/MD suburbs). After all, these are the people who are most likely to be repeat visitors and to bring visiting friends and family. I loved the Spy Museum, but I won’t pay another $20 to see it again. Same with the Corcoran. $10, or maybe an annual pass for everything in the city? Sure. Happy to help, Wayan. If you’re between the Newseum and the Spy Museum, go for spies–I liked it a lot more than the Newseum, even though I want to be a journalist. I’m a total news geek and i effing love the Newseum. In fact, Max is right – you can’t do it all in one visit. I might be able to do it all in three visits, in which case it becomes almost worth it to just become a yearly member, especially if you’ll have guests in town. The movies are great, the exhibits are great, and the staff is (surprisingly, for museum staff) INCREDIBLY helpful, friendly and enthusiastic. I could not have been more pleased. Monticello has the right idea – #15 for a house tour, but with a “Good Neighbor” price. Residents of Charlottesville or Albemarle County, and UVA students, pay $10, or free when accompanying a non-resident adult paying full price. Alas, the ubiquitous “convenience fee” applies, but here it’s only $1.50. Never could figure out why I’m paying for something that saves them printing, reduces their need for ticket sales staff, etc. I’d pay $20 for a concert ticket but not for a museum ticket. It is steep. Maybe $10 just because I know there is upkeep to consider. Also, I bet Smithsonians make a lot more money in collecting donations at the door rather than charging people to enter. Almost every visit my family makes a donation. That should have been the way to go. If you are willing to be there for four hours or more, go for it, there is a lot to see for $20. I also got to see it before it opened and came away impressed.